The global wood market has been a challenge in recent years; it is still difficult for big commercial sawing operations to keep their doors open and most of those who do manage are running with a minimal crew until things improve. Why is it, then, that sales of portable band sawmills are actually on the rise? While many people purchase the mills for their own use, a large number of the mills are the centre of successful businesses. In fact, many profitable sawmills started out as personal investments for private use, became a hobby, and progressed on to become a full-time business. 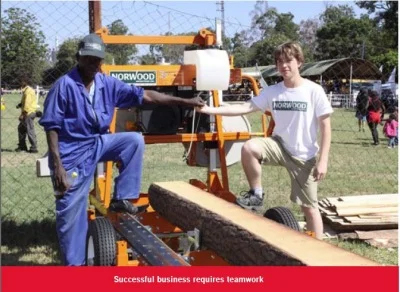 The investment in a Band Saw Mill is minimal: The mill itself costs between R55,000 and R130,000, and the support equipment (chain saws, loaders, trucks, etc.) is smaller and less expensive than that required for full production mills. A well-thought-out layout of the mill yard lets you make the most of your investment. A log-deck the correct height and size avoids the time and expense of starting up a loader to place each log on the mill. In many sawmill businesses, the first job the sawmill has is to build the log deck and roller tables. Roller tables make it easy to move slabs to a scrap pile and sort boards. They also eliminate the need to lift heavy beams. While a large number of mills are used out in the open, a mill shed to keep the mill out of weather is a good investment. The payback comes with fewer maintenance issues and better operating environment for the sawyer. This does not need to happen all at once before starting a business. The important thing is to constantly evaluate which equipment and modifications to the milling operation will help you meet your needs. Grow Your Sawmilling Business: Even when the market for lumber is too slow to support large corporate commercial sawmills, there is still demand for construction lumber and specialty woods. An affordable sawmill, such as the Norwood LumberMate LM29 or LumberPro HD36 can keep a sawyer and crew busy. Later, as your income grows, it is easy to expand your one-sawmill business by adding additional sawmills, each with its own specific function. Two sawmills, for example, can work in tandem with one rough cutting lumber and the other trimming boards to the desired width for kiln drying. The same two mills can also work independently, with one milling flooring and the other cutting siding or blanks for millwork. For a special order for long beams, the tracks of the two sawmills can be bolted together to make one long track. Track extensions can be added once there are enough orders for long beams to justify the investment. If there is a large order for a certain product, both mills can be set to the task to meet the demand. A Successful Business Requires Teamwork: While you may be able to go it alone for a while, a full-time operation requires good help. The mill is only making money when it is cutting wood, and you will soon find a lot of your time is spent purchasing logs, talking to customers, maintaining equipment, sorting lumber, sharpening blades and doing the accounting. By the time morning comes and it is time to go to work, you will already be exhausted! Find reliable help, and pay them enough to stay with the business. One sawmill can easily support you and at least two good workers. Avoid low value production jobs. Focus on niche markets that are too small or too specialised for the big mills. For example, a Norwood sawmill can, with optional extensions, mill logs of any length. If you have the only sawmill in the area that can cut 15 metre beams, you can just about name your price. Although you may not cut long beams on a regular basis, these jobs help keep the business profitable, and it takes no time to switch over to mill shorter logs for flooring or structural lumber. This flexibility gives portable band sawmills like the Norwood a huge advantage over the larger mills that must specialise in one product. Think twice before telling a customer that you can’t do a job. Base your decision on your experience and equipment, but don’t be afraid to try something new. While you will almost certainly have to turn down some jobs that do not fit your business, consider whether you can adapt to do the job profitably. It may open the door to similar jobs. If a customer needs paneling, it may be worthwhile to set up a dry kiln and planer to add value to your lumber. Since paneling is a common product, and the same equipment can be used to produce flooring and cabinet wood, it may be a good opportunity. Efficiency is the Best Payback of any Investment You Can Make: Even if the initial cost is a little higher, money saved on labour, fuel and maintenance goes straight to the profit side of your business. Efficiency also applies to the logs you mill. Obtaining logs is the biggest expense for sawmills, so it makes sense to get the most possible lumber out of every log. Tests show that thin-kerf sawmills like the Norwood band saws get approximately 15% more yield out of each log than circle mills, and create half the sawdust to dispose of. Keep your equipment simple and easy to learn to use. If your sawyer doesn’t show up for work, can another employee take the controls of the sawmill and keep it running? A scheduled maintenance programme and a stock of spare parts keep repairs to a minimum. Keep a set of spare parts, such as belts and bearings on hand, so you won’t have long delays in production. Sharpening your own saw blades can be a real money and time saver, and can help avoid having the mill sit idle while waiting for more saw blades. It also encourages your sawyer to change the blade before it gets dull which, in turn, will improve the quality of your lumber. Could a set of rollers save the time and expense of moving boards with a fork truck? Would a hydraulic log turner save enough time to pay for itself? Would a log leveler increase the yield from tapered logs? Would a sawdust blower be more cost effective than a worker with a shovel? These and other questions will, no doubt, arise. But if you approach them with an open mind and keep a long-term perspective, you will have the basis for a profitable sawmill business.